Oregon is home to 19 unique and extraordinary wine regions. Each of the regions (also known as appellations or AVAs) defines a unique terroir or climate that comes through in the wines. We're most well-known for the Willamette Valley, which stretches the length of half the state -- from Portland to just south of Eugene. Cool and moist, it's known worldwide for Pinot Noir. Of course, there's a lot more being grown up north. In the northern part of the Valley, seven small sub-appellations have been defined. Some wine drinkers swear they can taste the differences. Others, not so much. The Columbia Valley AVA stretches across the Oregon/Washington border and includes much of the Columbia River and its tributaries. Warmer and drier than the Willamette Valley, you'll find big reds and bold whites. The Walla Walla Valley is a sub-appellation of the Columbia Valley. While generally considered a Washington region, most of the wines produced in Walla Walla are grown in Oregon. The Rocks District of Milton-Freewater is a sub-appellation of Walla Walla, located entirely on the Oregon side. It is the only wine region in the United States defined by soil -- the baseball-sized rocks that permeate the land. Don't confuse the Gorge with the Valley! 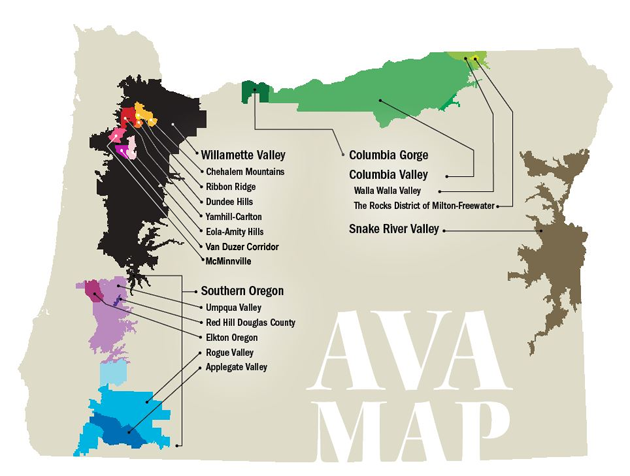 In Oregon, the Gorge AVA is just Hood River and Wasco counties (though it also stretches across the state line.) Just 40 miles long, annual rainfall drops a half-inch every mile from west to east. That means you'll find an extraordinary range of wines in the Gorge, from big fruit-forward reds to bright acidic whites. In Southern Oregon, you'll find warm-weather red wines reminiscent of Spain and Italy, as well as Bordeaux varietals -- including Tempranillo, Zinfandel, Merlot, Cabernet Sauvignon, and Syrah. There are plenty of fabulous whites too, including Viognier, Sauvignon Blanc, and more. An enormous AVA, the SRV is mostly an Idaho region the sprawls into Oregon. So far, just one winery on the Oregon side, so if you come across it, taste it!